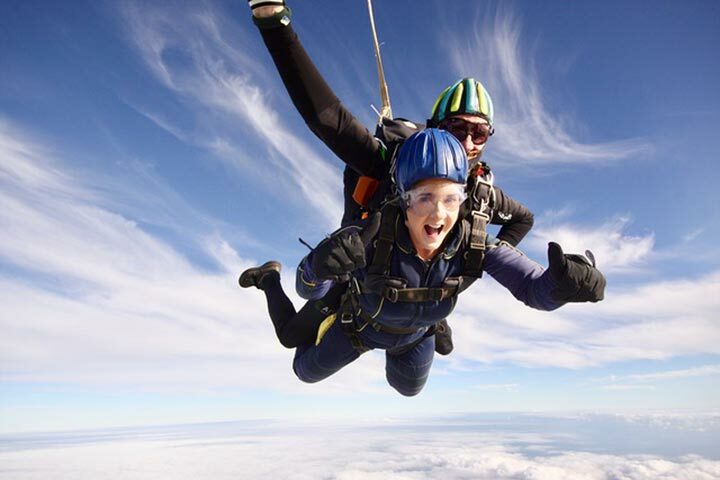 Enjoy the ultimate dare-devil thrill with an adrenaline-fuelled Tandem Skydive experience. Can anything be more thrilling than leaping out of an aircraft at 13,000 feet? You will experience nerves and excitement like never before. As you take off from the runway, your stomach will be full of butterflies and the palms of your hands will tingle and become sweaty. 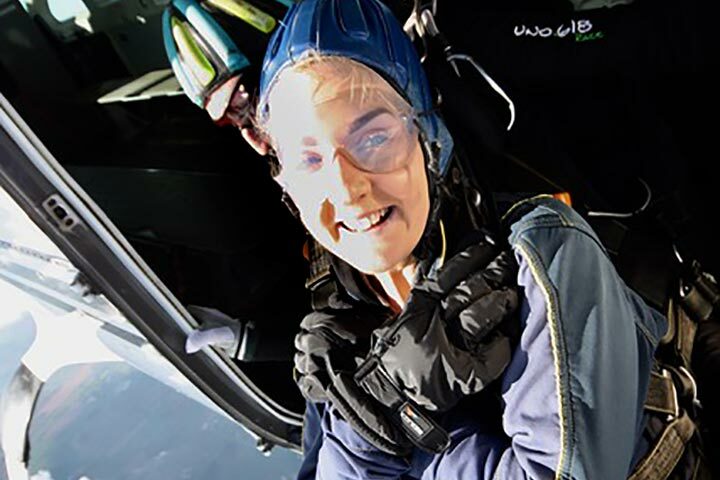 You climb to a height of 13,000 feet and the plane’s door suddenly opens and you are faced with the realisation that you won’t be descending to the ground in the comfort of the plane. The only way down is to drop out of the plane, attached to your instructor, and use a parachute to bring you back down to earth. 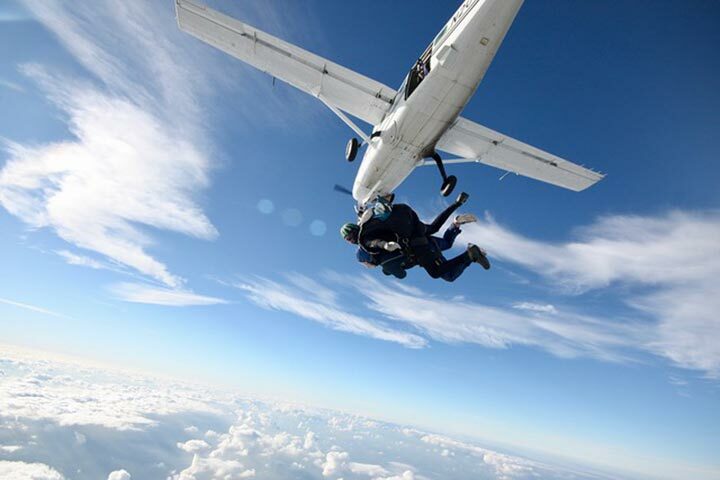 The great advantage of a tandem skydive is that you need no experience - just a 30 - 60 minute briefing before you jump. You'll be securely strapped to your instructor and, moments later, you're leaping out of a plane and skydiving to earth at 120 mph. 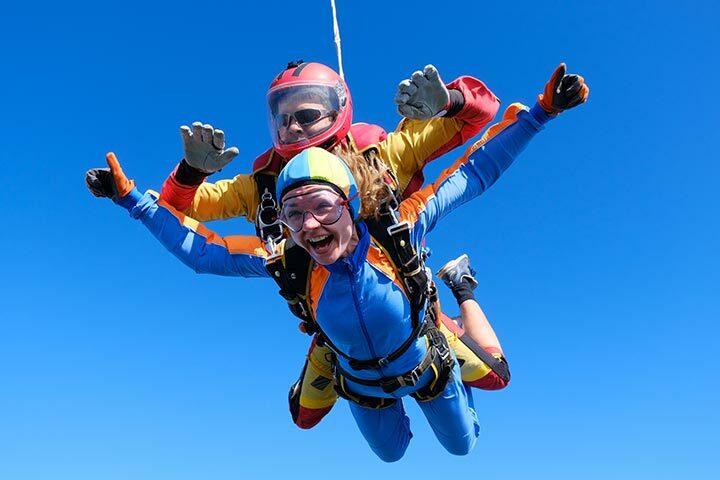 This is one of the most extreme sensations you'll ever experience - up to 50 seconds of free-fall and then your instructor will pull the parachute cord and together you fly the canopy back to the drop zone. 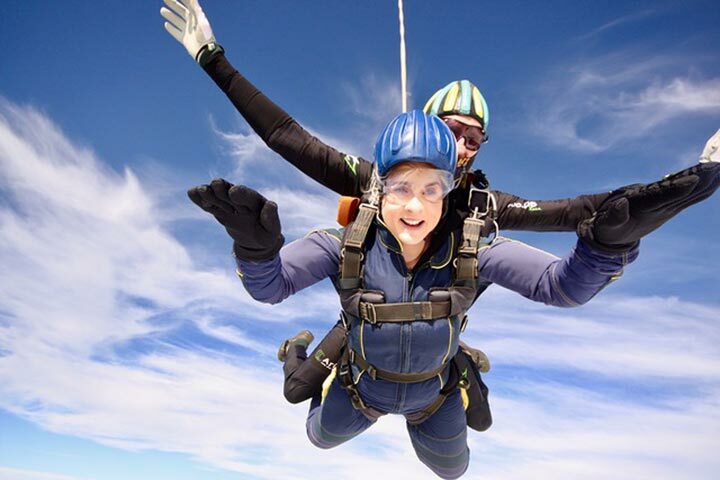 This is the ultimate thrill for adrenaline junkies! Your activity begins with a safety briefing from an expert instructor and pre-jump training to prepare you for your experience. Then, you are taken up in an aircraft to between 10,000 and 13,000 feet. Securely attached to your instructor by a dual harness, the free-fall will probably be the most exhilarating experience of your life. This is a great introduction to free-fall using a dual harness system - you'll jump with an instructor who controls the free-fall and parachute deployment and landing. 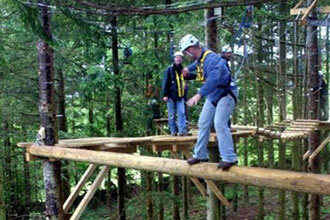 This activity may be suitable for disabled people - please contact us for more details. This experience is available Monday to Sunday (selected dates depending on the location), February to November. You'll spend approximately 1-4 hours at the centre but set aside a full day in case of poor weather. 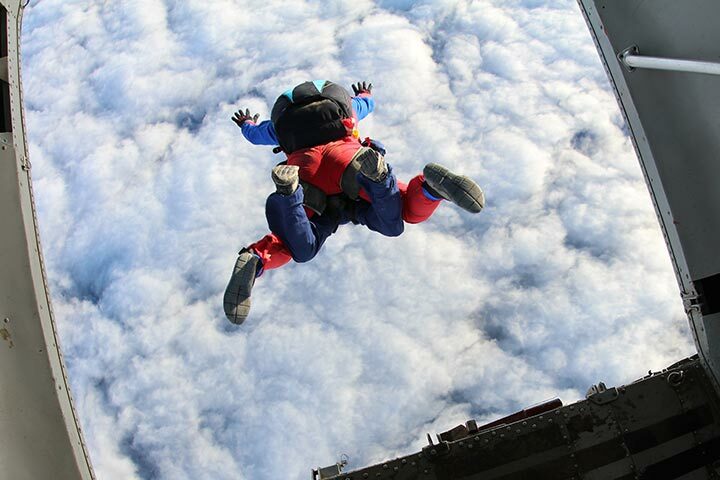 You are welcome to bring along family and friends to watch you skydive. You must be at least 16 years old (under 18 years must have parental consent). This may not be suitable for those who suffer from: epilepsy, fits, severe head injury, recurrent blackouts or giddiness, disease of the brain or nervous system, high blood pressure, heart or lung disease. The weight limit is 89-95kg (14-15 stone). 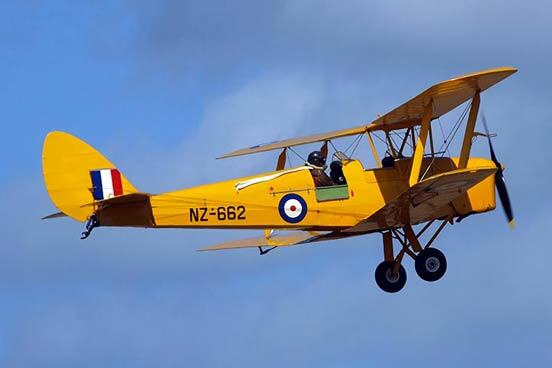 You will need to provide a signed BPA Fitness Form - signed by your parent/guardian if you're under 18, plus a Consent to Parachute; 40+ Doctor's Certificate portion of declaration signed. When I first arrived I was definitely starting to get a bit nervous, however due to my calm, friendly instructor I was put at ease. I decided to purchase the DVD package as it seemed good value for money and after all, I thought this is an experience I would probably like to relive over and over again! The instructor was able to answer any questions and worries I had regarding safety even cracked the odd joke to relax me! On the descent up the instructor went over the various manoeuvres and did the final safety checks. Then big red light came on, which meant one thing…… it was time to Jump!! I saw the most amazing views from 12,000 feet up in the air, this of course was the most incredible memorable moments I had ever experienced. I literally couldn’t stop smiling! Overall I would highly recommend this experience for any thrill seekers or someone looking to try something new. I shall definitely look to be booking another soon, it was without a doubt was one of the most amazing and memorable experiences I have ever had the pleasure of taking part in. Trust your instructor, they know what they are doing!